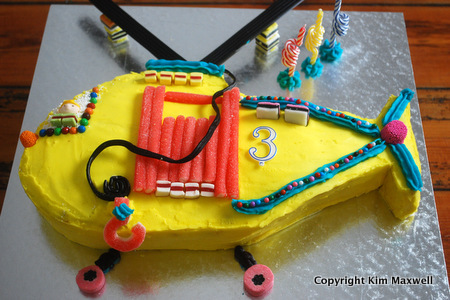 Flavourcape » flavourblog » RECIPE: Have you ever made a helicopter cake? 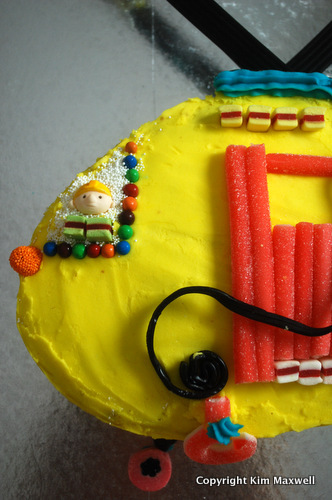 RECIPE: Have you ever made a helicopter cake? Once a year I take on unnecessary stress, indulge in a perfect parent complex and host a children’s birthday party. Onlookers are surprised that catering can be stressful when the average children’s party offers a few bowls of shop-bought sweet and savoury treats along the lines of Iced Zoo biscuits, marshmallows and Flings. In our house it’s an annual opportunity to catch up with adult friends (yes, the majority have kids) so I enlist grannies and friends to make sure that the edible adult-orientated nibbles are homemade and plentiful, and extend the budget to cover a few bottles of bubbly. It means that people enjoy themselves and most stick around. By far the biggest time-swallower is baking, icing and decorating (my favourite part) the birthday cake. It would be easier to order one, and take far less time to roll out fondant icing to cover crumbs and cake sections, but I hate the plastic taste. My cakes are iced with butter cream, smoothed over with hot water and a wide knife. 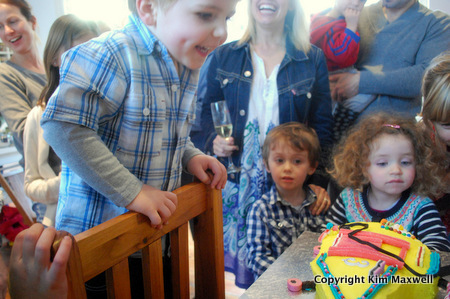 For Daniel’s third birthday, a helicopter cake landed on the table. He loves airport trips to watch planes take off, and has a toy helicopter with lights that flash and blades that whirl. Helicopter cakes viewed from the top often look a bit dumpy, so a side view made more visual sense. I used the same rectangular beer box cake recipe see Daniel’s beer box bus cake, drew a paper stencil off a photo print-out of a favourite toy rescue helicopter, and cut the design off the cooled cake. When the unreliable old oven you inherited with the house dies a week before the party and the labour and spares don’t justify the repairs, you borrow from the mortgage and negotiate a deal on a new electric oven with gas hob. Defy was an easy choice because it’s a brand I’ve used previously, and offers value for money and reliability. I can also position the cake tin directly on the black metal tray and use the thermofan setting at 10 degrees lower for the same baking time, saving energy. 3. Piped icing and gel colours will only get you so far. The key to a good children’s cake is lots of coloured balls and good sweet decorations. They’re the bits that are picked off as soon as the candles are blown out. I enjoy the challenge of sourcing the right visual shape for say, the jelly hook on a liquorice wheel ‘cable’, or the round liquorice allsorts ‘wheel’. Informed afterwards that the headlight or wheels or pink doorway didn’t pass muster, I realised it was the flavour of certain sweets that weren’t to my little person’s taste. Okay then. The look of surprise and glib happiness – You did this all for me? – on a three-year-old face always makes the hours spent so worthwhile. By the look on Daniel's face, he was rather pleased with his chopper! I'll think of you as a possible baker for me when I turn 37 next year! I also want a helicopter cake.